What To Do Before, During, After a Storm Like Hurricane Matthew? Hurricane Matthew Insurance Claim Denied? in order to be covered . . . "
Here is some great information from Caitlin Costa an experienced lawyer who represents home and business owners in Florida Insurance Claims. Denials of Claims are coming back at a furious pace. 1. Know your coverage. Request a complete, certified copy of your Policy. You are entitled to this, and may only have a Declarations page which does not fully capture your coverage or duties under the Policy. 2. Make sure that you are not underinsured. Hurricanes and other major weather events can wreak havoc on properties with wind, rain, flood, water intrusion and other types of losses that can create astronomical repair costs. 3. Document your conversations with your insurance company. a. Pay attention to deadlines. b. Try to get confirmation in writing. c. Keep a detailed notes of events surrounding damage, your claim, repairs, etc. 4. Be safe and be wary of scams. 5. Safeguard your property from further damage to the extent possible. Insurers like to claim their insureds did not “mitigate” or prevent further loss. 6. Make sure you understand what you’re signing- e.x. a work authorization vs. a full Assignment of Benefits. 7. Get a second opinion/back up quote regarding damages sustained. 1. Review your policy. If you do not understand your coverage, contact your agent or insurance representative. 2. Take pictures and/or video of the interior and exterior of your property before the storm. You may need comparison photos to substantiate future claims. 3. Make an inventory of valuable personal property and consider obtaining additional coverage for valuables. 4. Be prepared for the storm itself. 1. Be safe. Protect yourself and your family, and safeguard your property against damage in advance. 2. If you can safely do so, document damage to property as it is occurring (i.e. an active leak during the storm). 3. Pay attention to any deadlines in your Policy and make sure to comply. a. e.x. your insurer may request a “Proof of Loss” document, which often must be received by your insurer 60 days after loss, or 60 after requested depending on Policy. 5. Keep any and all repair receipts. 6. If it is not safe to remain on your property, be sure to know your Additional Living Expenses (ALE) Coverage. This coverage can help defray the costs of living outside of your home while it is repaired or rebuilt. 7. Keep any and all receipts for hotel stays and eating our if displaced. 8. Consider getting your own estimate for repairs. 9. Consult an attorney to preserve your legal rights. Since our last report on insurance claims that have not been paid, we have seen a spike in unpaid claims. Many Hurricane Matthew Claims are Not Paid by Insurance Companies. 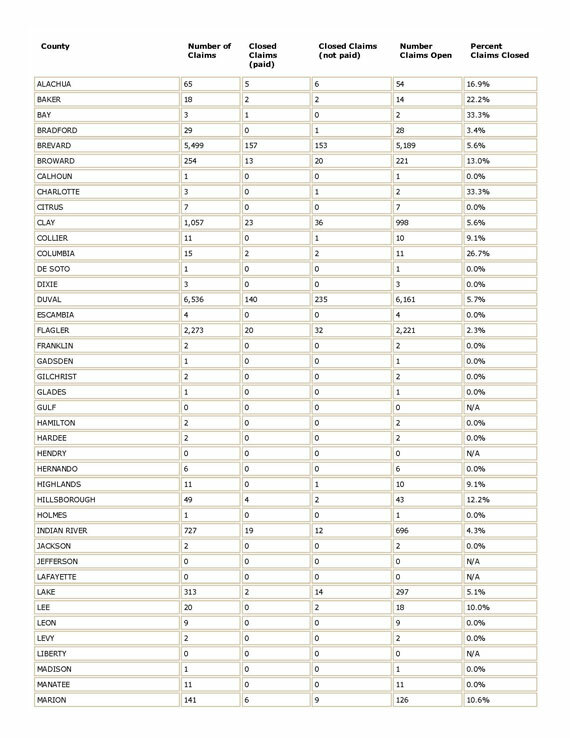 The number of claims nearly doubled to 75,215. 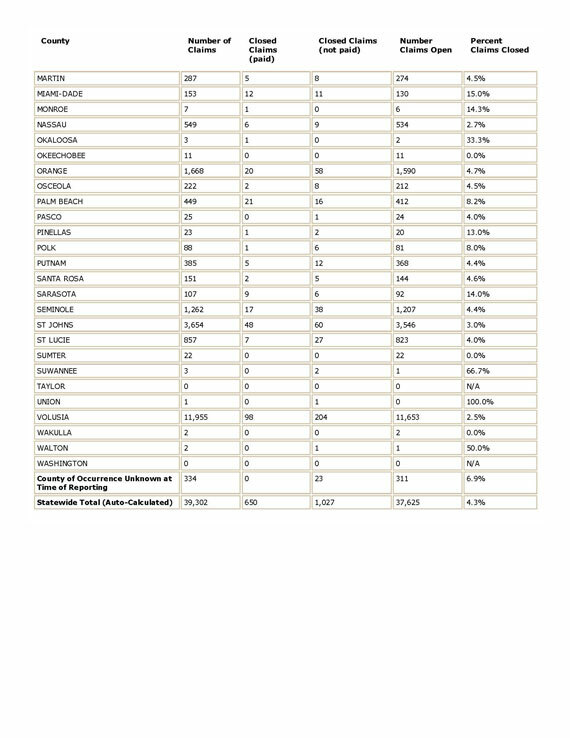 Volusia County has 22,000 claims. 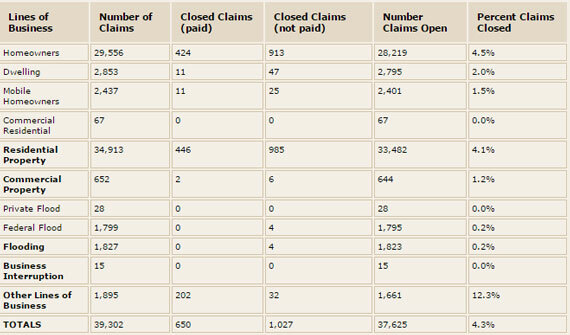 870 claims have been closed without paying the policy-holders. 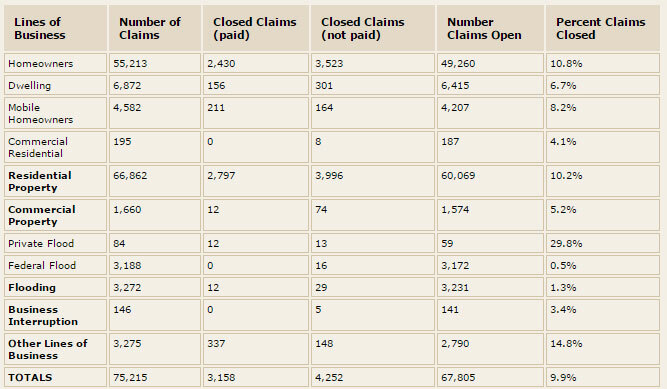 In fact there are more claims closed without payment (870) than there are that have been paid (586). The numbers speak for themselves. See the data above. Amazing Tech - The team at NASA built a strong building when they built the place to assemble the moon rockets. It was virtually untouched by #Matthew. 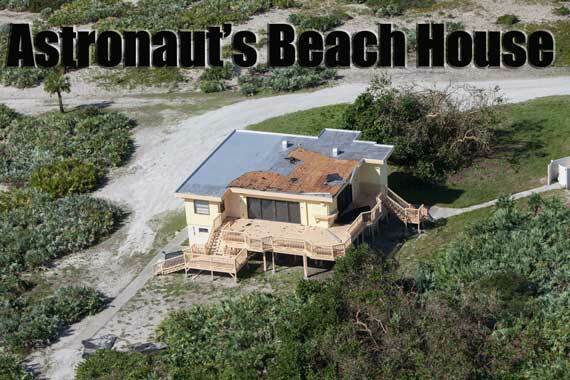 However, check out the beach house where the astronauts play. The beach house was damaged during Hurricane Matthew. 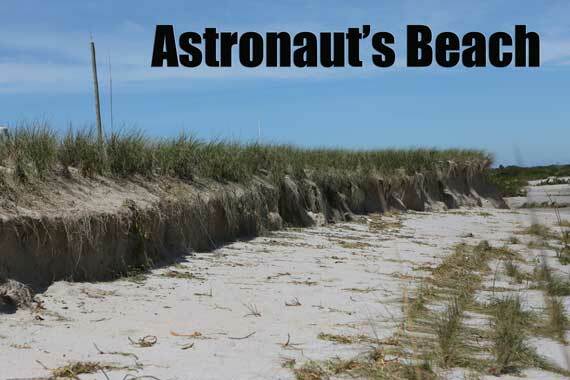 This was the site of some legendary beach parties with the astronauts. According to NASA, "The Beach House is seen during an aerial survey of NASA's Kennedy Space Center in Florida on Saturday. The survey was performed to identify structures and facilities that may have sustained damage from Hurricane Matthew as the storm passed to the east of Kennedy on Oct. 6 and 7, 2016. Officials determined that the center received some isolated roof damage, damaged support buildings, a few downed power lines, and limited water intrusion. Beach erosion also occurred, although the storm surge was less than expected. NASA closed the center ahead of the storm’s onset and only a small team of specialists known as the Rideout Team was on the center as the storm approached and passed." The beach and coastal dune system did the job, but was sacrificed. It appears that the sea oats have been replanted to catch sand for the next storm event. According to NASA, "A beach area . . . survey was performed to identify structures and facilities that may have sustained damage from Hurricane Matthew as the storm passed to the east of Kennedy on Oct. 6 and 7, 2016. . . . Beach erosion also occurred, although the storm surge was less than expected. " According to sources here are a few details about the Hurricane Matthew and the storm's devastating toll. 3 dead in South Carolina. Please share this hurricane resources map known as the Google Crisis Map that shows resources available to victims of #Matthew or other natural disasters. The map is updated in real time and shows resources available for natural disasters other than hurricanes. 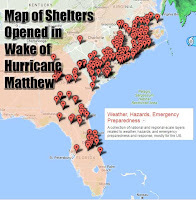 The image to the left is a Map of Shelters Opened in the Wake of Hurricane Matthew and shows the resources available on the Sunday after Hurricane Matthew exited Florida, the Southeastern United States, and the Atlantic Coast. The link and embedded map below are current. Hurricane Matthew packing winds of 120 miles an hour. 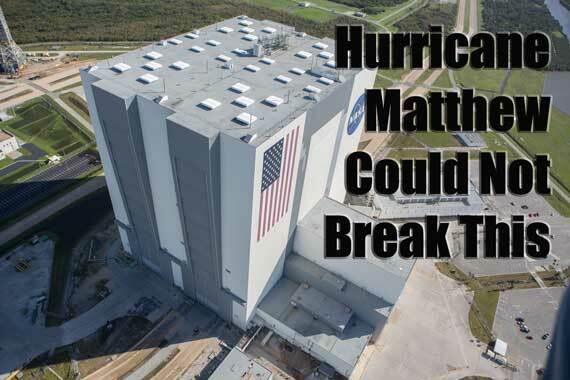 Matthew is heading toward Florida where it probably will cover the Kennedy Space Center. The National Hurricane Center issued hurricane warnings for almost the entire East Coast of Florida.